Having read ‘The 100-Year Life’, I wonder if I was adopting its prescriptions ahead of time. I have definitely not experienced a 3-stage life! So far, I have had 5 careers. That encompasses about a dozen jobs and employers. In between these I had numerous career breaks, both voluntary and involuntary, ranging from ‘travelling’ in the 1980s to full-time education (ages 25-28 and 41-42) and even overseas voluntary work aged 46-47. The catalyst for these breaks has varied from redundancies (3 so far) to a desire to expand my options, experiences and networks. I am now a self employed business consultant, which offers the sort of variety and challenges that no employer was ever able to provide. It’s also one of the lowest paid jobs I have ever had, because I don’t yet have enough clients or experience to earn a steady income. I don’t care! It was at the age of 44, while in an unpleasant, but high paying role, that I vowed only ever to pursue interesting and enjoyable work, regardless of the pay involved. Sanity outranks income. Due to my own financial circumstances, which are not strong, I decided at the age of 50 to continue working as long as I can. Retirement is not attractive, partly because I want to stay active and involved. Fortunately, I remain fit and healthy. If I am able to earn a good income again in the future, I will ‘bank’ as much as possible for retirement or ill-health. Strategically, I am now planning to retrain myself for the next wave of business and technology changes (i.e. artificial intelligence) in order to usurp the current cohort of 25-40 year olds who are tied to existing technologies. 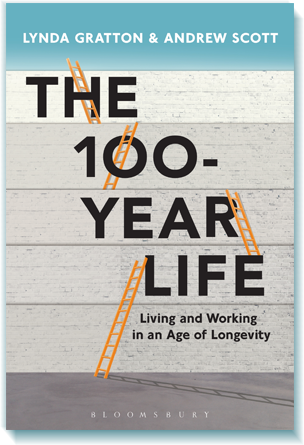 I run a business book club which is now reading ‘The 100-Year Life’, so I’m looking forward to discussing these meaty topics with other members very soon. Best wishes to everyone who has got this far (both literally and metaphorically).